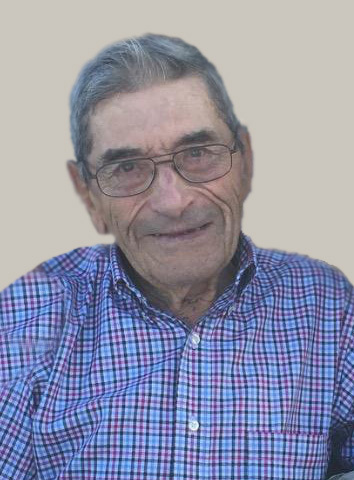 Allan J. Batzler, 94, of the town of Barton, passed away on Wednesday, March 28, 2018, at his home, surrounded by his loving family. Allan was born on November 1, 1923, in St. Killian, the son of the late Adolph and Mary Batzler, and on June 25, 1947, he was united in marriage to Leona Matenaer at St. Mary's Immaculate Conception Catholic Church in Barton. Leona preceded Allan in death on December 25, 2014. Allan was a member of St. Mary's Immaculate Conception Catholic Church, St. Joseph’s Society, and was involved in the Moose Lodge in West Bend. Allen was employed at Gehls in his early years while farming. Allen liked traveling, enjoyed playing sheepshead with friends and family, and loved fishing and the outdoors. He was a jack of all trades and could fix and weld anything. Allen loved polka music and always had it playing in the barn. On the farm, Allen loved taking care of the animals and working the land. He was grateful to be given the opportunity to farm on his wife’s homestead. Those Allan leaves behind to cherish his memory include four children, Gary Batzler of the town Barton, Jane Korth of Kewaskum, Pam (Terry) Jobe of Eden Prairie, Minnesota, and Lisa (Jack) Schroeder of Belgium; five grandchildren, Elizabeth (Rob) Hollway, Andrew and Madeline Jobe, Katelyn (Eric) Mueller and Michael Korth; a brother, Donald (Virginia) Batzler of Campbellsport; a brother-in-law, Steve (Margaret) Matenaer of West Bend; three sisters-in-law, Mary (Paul) Wassenberg of Menomonee Falls, Estelle Matenaer of St. Michaels, and Carol (Donald) Winninghoff of Woodruff; nieces, nephews, other relatives and friends. In addition to his wife and parents, Allan was preceded in death by his parents-in-law, Edwin and Marie Matenaer; two sisters-in-law, Adeline (Ed) Volm and Gene Matenaer; four brothers-in-law, Norman Matenaer, Francis (Betty) Matenaer, Ray Yarnig, and Ralph Matenaer. A Mass of Christian Burial for Allan will be held at 1:00 p.m. on Wednesday, April 4, 2018, at St. Frances Cabrini Catholic Church in West Bend. Father Justin Lopina will officiate and burial will follow in St. Mary’s Cemetery in Barton. Allan’s family will greet relatives and friends at the church on Wednesday from 11:00 a.m. until the time of Mass. In lieu of flowers, memorials to St. Mary's Immaculate Conception Catholic Church in Barton are appreciated. The Myrhum Patten Miller and Kietzer Funeral Homes have been entrusted with Allan’s arrangements. Additional information and guest book may be found at www.myrhum-patten.com.